Photo: Brandon Moore-McNew, June 2014. Getting there & around: Your destination is Perthshire, and you will need a car to tour the McGruther/Magruder heartland–or a bike, if you’re a fit and devoted cyclist who can put up with a little (or maybe a lot of) rain. If you only want the car in Perthshire, take the train to Perth, then a short taxi ride to a car hire office. If you pick up and drop off the car in Perth, you’ll never have to brave it on highways or on city streets. Ask the car-hire staff to explain to you how to pass other vehicles on single-track rural roads. Don’t worry–there’s a system and it’s easy, all the roads are paved, and you won’t meet many cars on those wee roads anyway. Don’t forget to ask directions for getting out of town onto the right road. Remember that if you’re confused in a roundabout, you can just go round again till you spot the right sign! For photos and directions, use the pages that branch off from this one. On this page you’ll find a quick historical summary, to help you figure out where you’d like to go and why. This summary is based primarily on the writing of Don McGruther, John MacGregor, and Charles Kurz, with a few added bits from Hugh Rose. You can find those sources (except for Hugh!) on my bibliography page Magruders/McGruthers in Scotland and America. Names in bold are those for which I’ve provided directions and/or photos on the pages branching off from this one. For Drummond Castle and Innerpeffray Library I’ve provided links to their web sites. The oldest indisputable record of our name is from Comrie, where on 10 March 1447 Gilawnene MacCrouder signed as witness to a charter. The oldest record that might be an instance of our name is one Gilcolinus Makgugir who appears in a court record of 1264 at the priory of Dull. Originally a Culdee abthanerie, Dull passed into secular hands at around that time. By the 14th c. it was held by Sir John Drummond, ancestor of the Drummonds with whom our ancestors were so closely associated. The next hundred years are pretty sketchy. In 1502/03 and 1508 a Jacobus (James) McGrugor is named in surviving records, and in 1525 a Duncanus (Duncan) Makgruder is named as a supporter of John Drummond of Innerpeffray. We postulate that Duncan may have been the son of James, but no surviving records confirm it. In 1540, Alexander Cumry settled lands in Ross on his wife, Cristine Makruther, and in the same year Cristine married John Duncanson McGregour. Note that this couple are not the ancestors of Alexander Magruder. We don’t know the relationship between his family and Cristine Makruther, but we do know that after the MacGregor Proscription in 1603 Cristine’s MacGregor’s sons changed their names to Drummond and took part in at least one attack on outlawed MacGregors. From this point on we have a bit more evidence and a picture of the family begins to emerge. In 1544, a James McGruder is mentioned in a testament made by Jean Bourdoun at Craigneich, the farm near the mouth of Glen Artney where we believe Alexander the Immigrant was raised some 70 years later. 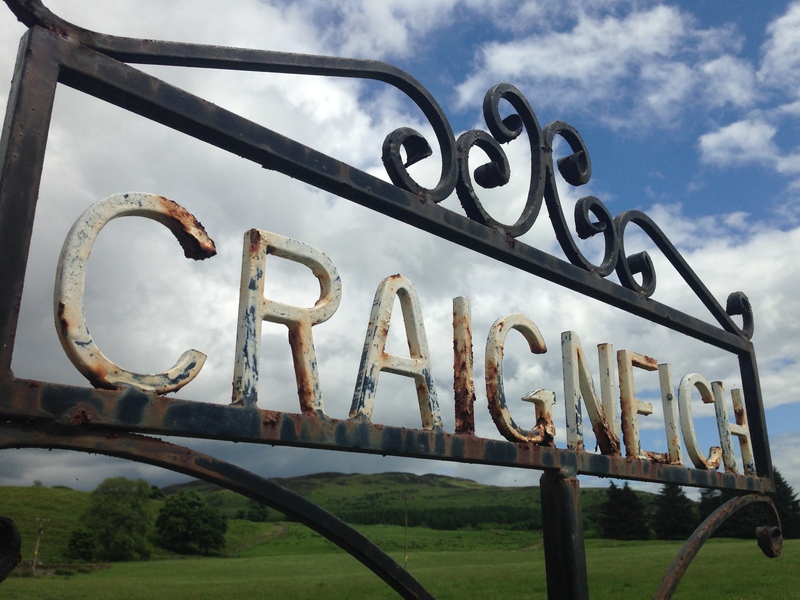 In 1546, Duncan McGruder witnessed the testament of Agnes Burdoun “at Craignoch.” These records demonstrate a close connection with the Bourdouns, though we can’t be more specific. It is possible one of these Burdoun or Bourdoun women was the wife of James McGruder. Other records show that Duncanus Makgruder matriculated at the University of St. Andrews in 1545, and that in the following year he or another Duncan McRudder was witness to a transfer of land rights between Archibald Campbell and Robert Drummond. On my family tree for Alexander Magruder, the Immigrant, I call this James “James I” and place Duncan as his son. I have followed the assumptions of researchers familiar with the primary sources, but do keep in mind that we have no proof of the relationship. The mid-16th c. was the time of the Reformation in Scotland, and luckily one of our ancestors played a small part in the struggle between the Catholic Mary, Queen of Scots, and the Protestant peers who opposed her rule, thus leaving a record that offers the earliest clear glimpse of the McGruder family situation and loyalties. In 1545, a group of noblemen, led by Lord Ruthven, rebelled against Queen Mary and laid siege to her troops at the port city of Leith (now part of Edinburgh). Among these Prostestant Lords, as they are known, was David, the second Lord Drummond. When pardon was granted to the rebels the following year, among those pardoned were James McGrudir and Duncane McRudir. James was referred to as a servant to Lord Drummond, and it is certain both would have been tenants on the Drummond lands in Perthshire, probably at Craigneich. On my family tree for Alexander, I call this James “James II”, a brother of Duncan. In 1586, the same or another Duncan McGrudir, along with James Burdoun and James Drummond, Commendator of Inchaffray Abbey, were witnesses to a landrent agreement called a tack. The Commendator of Inchaffray was a younger son of the second Lord Drummond, and brother to the 3rd Lord Drummond. In 1590 a bond to which he was party was witessed by James McGrowther. Taken together, these records show the family in close association with Lord Drummond and his immediate family from a very early date. They would have lived on Drummond lands, holding Craigneicht and possibly other farms, and enjoyed a fairly high status and standard of living–not like the Drummonds themselves, but significantly better than an average farm family. We have one record, from 1591, in which James Cuik, identified as the servant of Duncan McGruder, was witness to a business transaction in Crieff. From James II onward, we have more consistent evidence of births, deaths, and marriages, and are more certain of family relationships. I won’t repeat the genealogy provided on my version of Alexander’s Family Tree, but we can say with confidence that in this period the family fortunes were rising. James II had two sons, John and Alexander. John became Chamberlain to Patrick, the 3rd Lord Drummond, and made the huge leap from tenant to owner of his own farm, Meigor, in Glen Artney. We do not know if he acquired Meigor through purchase, through marriage, or as a gift from Lord Drummond. Records from that time forward refer to John and his heirs as of Meigor, indicating ownership, rather than in Meigor, which indicates tenancy. Other McGruthers, of unknown relationship to our family, are also recorded in Glen Artney during this period. You can read about John’s descendants in John MacGregor’s article, The MacGrouthers of Meigor--download the PDF from my Magruders/McGruthers in Scotland and America bibliography page. This John is the uncle of our Alexander. Alexander (whom I call Alexander I, on the family tree–the father of our immigrant ancestor) never acquired ownership of land, but instead became Chamberlain to James Drummond, Commendator of Inchaffray Abbey (and later the 1st Lord Madderty). Thus we can be certain that our Alexander spent at least part of his boyhood around Lord Madderty’s seat at Inchaffray. Commendator of Inchaffray Abbey was a title bestowed by Mary, Queen of Scots, and though the Commendator was officially head of the abbey, he was in fact a secular lord whose title gave him control of the wealth produced on the ancient abbey lands. Mary’s son, James VI (later James I of England and Great Britain) raised James Drummond’s title to Lord Madderty. Some sources say the Drummond boys (the future Lord Madderty and his brother the future Earl of Perth) were educated with James VI in his youth. I have found no confirmation of this in historians’ accounts of James VI’s boyhood and education, but he trusted them with great responsibilities and rewarded them with titles and advancement. If you search on line you’ll find some old books about Inchaffray Abbey. In or before 1605, Alexander the elder married Margaret Campbell, widow of Andrew Drummond of Balmaclone (now Nether Belliclone) in Madderty Parish. These were our Alexander’s parents. Margaret had lifetime rights to Belliclone, which her eldest Drummond son would inherit upon her death. Alexander himself was a younger son, and thus would not inherit rights at his own home place, Craignecht. So, in effect, he married the land at Belliclone along with Margaret herself. It is plausible that their marriage was arranged by Alexander’s employer, James Drummond, or by his brother, Lord Drummond, who, as head of the Drummond family, would have had both the right to arrange affairs at Belliclone and an interest in doing so. However the marriage came to be, this is why our ancestor, the younger Alexander Magruder, was born at Belliclone, a Drummond farm, rather than a place with deeper McGruther associations. We assume that after his father’s death and his mother’s remarriage–in 1617–our Alexander would have been raised by his father’s family at Craigneicht, as this was the custom. Margaret and Alexander’s oldest son, James (called James III in the family tree) became Chamberlain to the 4th Lord Drummond who in 1605 was raised to the title of Earl of Perth. Thus, we can add Drummond Castle to the list of places closely associated with our family. This James McGruther also may have acquired ownership of land, as some later records refer to him as James McGruder of, rather than in Cargill. Unlike his cousin in Meigor, however, he left no records of later generations at Cargill. Our single, slim written record to indicate Alexander the Immigrant’s birth date and identity is the record of one Alexander McGruder, aged 12, having been fined for hunting illegally near Cargill, in 1622. Since we don’t know what our Alexander was doing between 1622 and his appearance in Maryland records in the 1650s, we can’t say if or how often he may have been with his brother at Drummond Castle. But don’t let that stop you from visiting–the castle is private, but the public gardens are spectacular. See Was Alexander Who We Think He Was? for more about why we’re so sure. So those are the primary sites of McGruther history in Perthshire–Comrie, Craigneicht, Meigor & other sites in Glen Artney, Inchaffray, Belliclone, Drummond Castle, and (a bit to the Northeast) Cargill. If you love books, another site you shouldn’t miss is the Innerpeffray Library, founded in 1680 by the 3rd Lord Maddertie–the first free public lending library in Scotland, and open to all. Innerpeffray continued to lend books until the 1960s, and today is a lovely museum, located among trees on the bank of the River Earn. Location, hours, and directions may be found on the website. Adjoining the library is the family’s private chapel, into which some of our McGruther relatives are sure to have stepped from time to time. 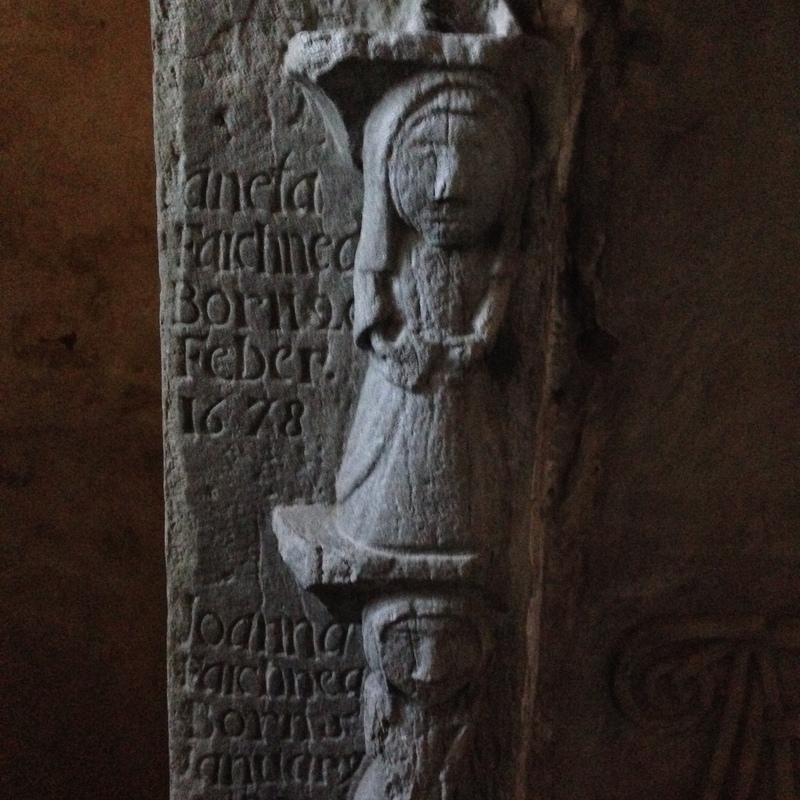 Detail from a memorial plinth in the Drummond family chapel, Innerpeffray. Photo: Susan Tichy, June 2014.